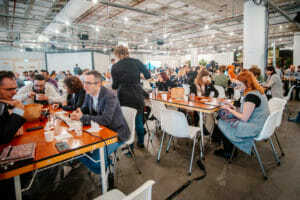 Coworking Europe 2019 is heading East! We are very happy that the Coworking Europe Conference 2019 edition will take place in Warsaw on November 13th, 14th and 15th. For the first time, and for its 10th anniversary, the Conference is going to Eastern Europe where we plan to experience a young, but extremely fast growing scene. We are expecting to gather more than 700 delegates from 55+ different countries during 3 exciting days. We believe that coworking is in the center of a variety of social trends and technological developments such as digitalization, urbanization & sustainability. We want to help understand and embrace those shifts in order to develop new business opportunities and shape the social and work environment of the future. We want to facilitate the disruption happening in the real estate and workspace markets. This is why, during our get together, community experts, real estate developers, ecosystem managers, city planners, coworking space operators, designers, facility managers, investors, flexible workplace operators, players from the rural world, incubators, social entrepreneurs and many more will share thoughts, figures and best practices in the buzzling, young local scene of Warsaw. Hesitate no more and join the discussion; registration is open and Early Bird tickets are available until June 30th. We look forward to another great edition and to welcoming you there.